Americans pull out the plastic… small business’ biggest challenge right now… boom times for bartenders and hotel cleaners… and more! Quietly, the stock market has staged a rally the last two weeks. “Reminder,” Alan says — “every stock sell-off in market history has rebounded to mark new higher highs. Sound outlandish? Not if you think about where we are in the economic cycle. 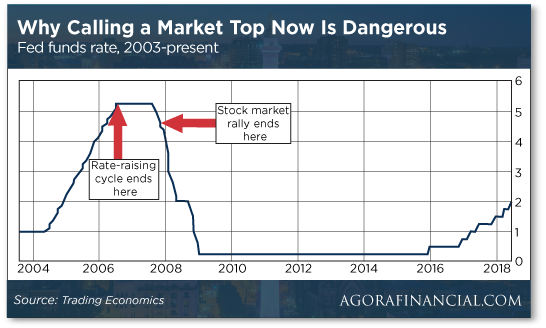 Typically the stock market doesn’t reach its peak until after the Federal Reserve is done with a round of interest rate increases. The most recent example we can point to is the prelude to the “Great Recession.” In June 2004, the Alan Greenspan Fed finally started lifting its benchmark fed funds rate from (what was then) a record-low 1%. Up, up, up with virtually every meeting of the Fed’s Open Market Committee… until they were finally done two years later at 5.25% in June 2006. Key point: Stocks kept rallying for more than a year before finally topping out in October 2007. It only makes sense. 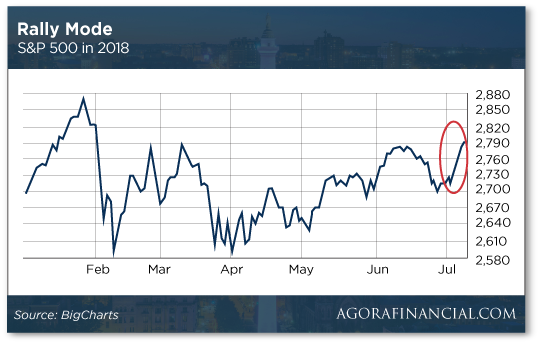 When the Fed stops “tightening” monetary policy, that means there’s more money sloshing around Wall Street for traders to bid up stock prices — at least for one final rally before the effects of the tightening can make themselves felt. Then the stock market and the economy start to roll over. So yes, going by that history, the S&P 500 could easily set new highs and then reach even higher. And the next push begins later this week: “Earnings season starts Friday with growth of 20% expected for Corporate America,” says Alan. We’re talking about what Wall Street considers the “official” start of earnings season, with JPMorgan the first to report among the 30 stocks in the Dow Jones industrials. But outside the Dow 30, PepsiCo got a jump on earnings season — reporting its quarterly figures before the open today. The numbers beat analyst expectations handily. As we write, PEP shares are up nearly 4% on the day. “This is an exciting time to be in the stock market,” Alan says, anticipating the start of the 42-day earnings season. So exciting that he’s making an unprecedented guarantee for new subscribers of his earnings-driving trading service called the 42-Day Retirement Plan. To be clear, if fewer than 20 of his trades double in value, the service is yours free. This offer expires when earnings season starts Friday. Check it out right here — there’s no long video to watch. As the day wears on, the S&P 500 is up eight points. Only eight more and the index will be back above 2,800. The only major index in the red today is the small-cap Russell 2000… and it’s still not far from its June 20 peak. Gold’s rally the last week is turning into a two-steps-forward, one-step-back affair. At last check the bid on the Midas metal has pulled back to $1,256. Crude is two pennies shy of $74 a barrel. The big economic number of the day came out late yesterday. The Federal Reserve says consumer credit leaped by $24.6 billion in May — almost double what the “expert consensus” was counting on. And for once the big driver of the increase was not auto loans or student loans, but credit cards — which registered their biggest increase in six months. Spending at that pace should certainly boost corporate earnings the next six weeks. Of course, all that debt is destined to end in tears as it always does… but for now, it’s party on. 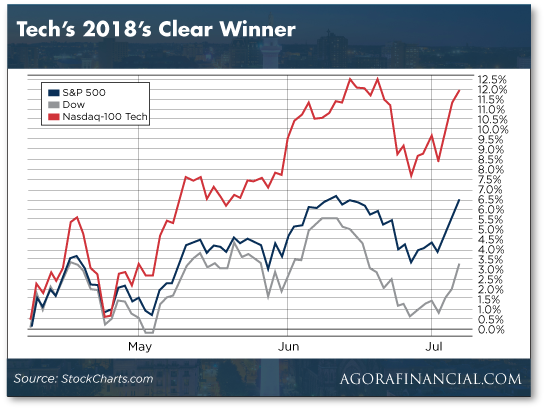 “Tech’s the clear winner,” says Ray Blanco — examining the performance of all market sectors during the first half of 2018. One of Ray’s favorite names in all of those futuristic niches is a name you might think of as stodgy and behind the times — IBM. But nowadays the company isn’t your father’s IBM, says Ray: “IBM has Watson, their groundbreaking artificial intelligence platform. Watson is at the bleeding edge of AI. “Unlike past approaches, which required rigid programming on the part of humans to work, Watson is able to adapt and adjust based on its experience — much like our own brains do. Watson is even helping in medical research — identifying five genes linked to ALS, or Lou Gehrig’s disease. “IBM’s Cognitive Solutions segment has now become its second-largest business,” says Ray, “pulling in $4.4 billion in revenue last quarter. “IBM’s chair, president and CEO Ginni Rometty sees a multitrillion-dollar opportunity for the company in AI, machine learning and cognitive computing. The most recent earnings numbers gave IBM shares a quick 10% bump. Since then they’ve pulled back — which Ray says gives you a chance to pick up shares at a bargain price in advance of the next earnings report, due just days from now. “Small-business owners continue to report astounding optimism as they celebrate strong sales, the creation of jobs and more profits,” says Juanita Duggan, president of the National Federation of Independent Business. The NFIB is out with its monthly Small Business Optimism Index. At 107.2, the June figure pulled back from May… but the May figure was the second-highest in the 45-year history of the survey. NFIB members clearly feel good about a lighter burden of taxes and regulations. Within the survey, we see 63% of respondents either hiring or trying to hire — the highest level since September 1999. However, out of that 63%, seven out of eight say they have few or no qualified applicants. Here at Agora Financial we’ve been on the case of the “steal of the century” in real estate since 2012. That year, the federal government hatched a scheme called “REO-to-rental” — in which big-bucks investors could buy foreclosed single-family homes at a deep discount and manage them as rentals. These homes were available only to investors who could drop $1 billion on a bulk transaction. If you merely wanted to buy the bargain-priced foreclosure down the street and pull in a little rental income, you were out of luck. It was crony capitalism at its worst. Sounds great in theory. 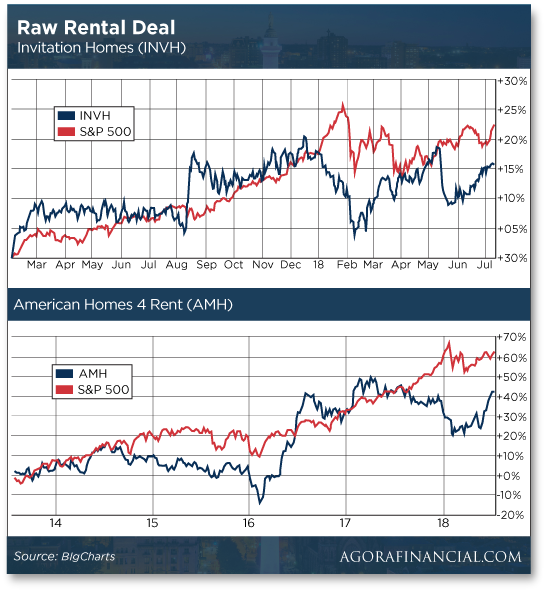 But these rental REITs have been stinker investments for as long as they’ve been publicly traded. They’re not going to get any better when the managers are buying new properties at full price. “So glad to see this realistic comment,” a reader writes after our discussion of the June job numbers last week — especially our take that people who’d given up looking for work long ago are starting to look again. The 5: Not us, to be sure. Our old friend Chuck Butler of the venerable Daily Pfennig e-letter spotted a couple of other interesting tidbits. First, of the 213,000 “new jobs” created in June, 104,000 of them come from the so-called “birth-death model.” That is, they’re jobs that Bureau of Labor Statistics wonks assume were created because owners of startup businesses are too busy to respond to Labor Department surveys. Now, “Of the 104,000 jobs the BLS added out of thin air,” Chuck writes, “they claim that 89,000 of them were in the leisure and hospitality sector… In fact, they’ve added 373,000 jobs for this sector this year! Amen, Chuck. This “recovery” is still subpar. 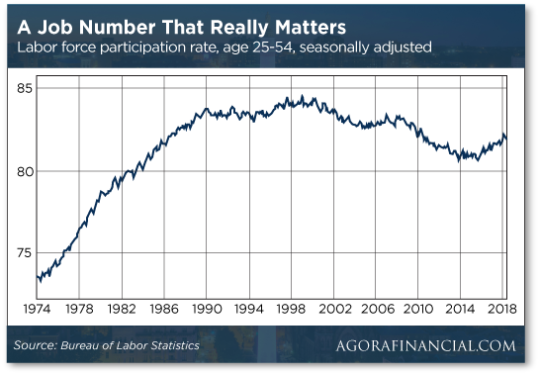 Another way to look at it is the labor-force participation rate among people ages 25–54 — that is, people either working or looking for work during what’s theoretically the “prime earning years.” And while the percentage is recovering from its lows in 2015, it’s still lower than it was anytime between the late 1980s and the Panic of 2008. P.S. Alan Knuckman is making an unprecedented guarantee going into the start of earnings season on Friday. Yes, terms and conditions apply. But we think you’ll like them. See for yourself at this link.